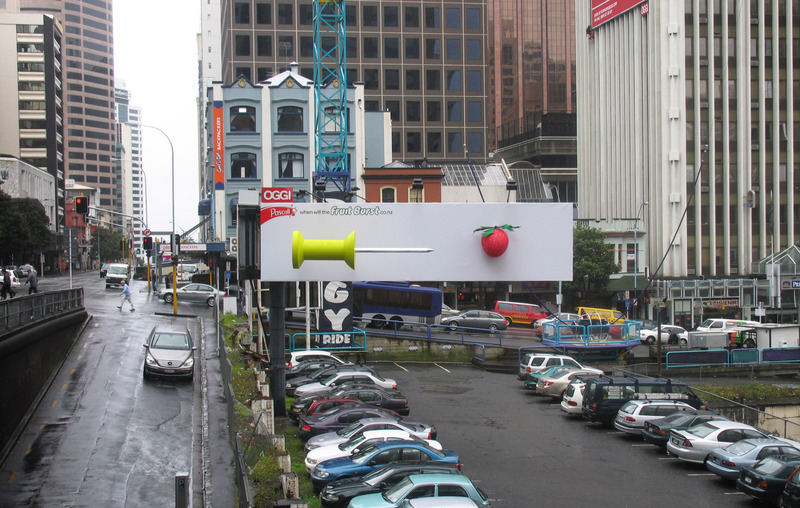 Cadbury in New Zealand is building public interest in the Pascall Fruit Burst confectionery line with a billboard and web site, asking the question, “When Will The Fruit Burst?”. A giant strawberry balloon, full of Pascall Fruit Bursts and New Fruit Burst Jellies, has been attached to a billboard in Victoria Street, Auckland City, next to a giant pin. As the balloon gradually fills with air, it moves closer and closer to the pin. At some point thousands of wrapped sweets will fall on to the parking lot below, to be given out to passersby. Members of the public are invited to win $5000 by guessing when will the balloon will burst. The billboard is shown in a live stream at whenwillthefruitburst.co.nz and is being promoted in a Facebook group. The Fruit Burst campaign was developed at DDB New Zealand by executive creative director Toby Talbot, art director James Conner, copywriter Christie Cooper, group account director Greg Jones, account director Keri Aves, account executive Sophie Martignier, production manager Andy Robilliard. The billboard was constructed by ThreeSixty.